I was born in Dearborn, Michigan, and have lived in Michigan my entire life. My parents are from the south and returned to their roots. My siblings followed. My mother died in 2004 and I miss her sorely. I am married to a wonderful lady and, together, we have two children, who are actually no longer children at all. Times flies! My wife, Michelle, and I enjoy camping, sight seeing, and each other’s company. We actually do have a really good marriage. I say that because it seems to be rare these days. 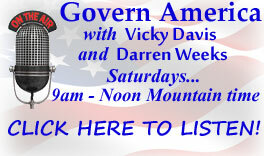 Aside from working, probably the biggest thing that consumes my life is doing my patriot talk radio show, Govern America. I began broadcasting in my teenage years, buying air time on stations large and small, in different markets. I did broadcasts for my local church at the time. Some of them were issue-oriented talk shows, and some were church services. I attended the Specs Howard School of Broadcast Arts (now renamed to Specs Howard School of Media Arts) in Southfield, and graduated in May 1991. I dabbled in radio, working at WJCO AM-1510, a small station in Jackson, Michigan, for a while before and after I graduated. I soon realized I couldn’t make a living in radio. In September 1992, I was hired by WILX-TV 10 in Lansing, Michigan, first as a production assistant, then as an engineer in master control. I worked there until April of 2001, where I worked until being hired away by their competition WLNS-TV 6. I left there to go to work in broadcast services for a university in February 2008. I had always suspected that the people were not being told the truth about the state of our country. When I was employed at WILX, I used to switch the local commercial breaks for the Rush Limbaugh TV show. Rush used to talk positive about America’s future. The reality of what I was seeing in society didn’t match his optimism. One day, I discovered a satellite guide laying on an equipment rack in master control. I noticed that you could tune to different audio frequencies on the C-band satellite receivers and there were radio stations there, so I decided to check them out. After tuning around for a while, I discovered a network by the name of Republic Radio International, which featured different hosts talking about the issues and real news of what was going on in our country. Instinctively, I knew this was the information that I wasn’t getting from the mainstream media. Eventually, I contacted one of the hosts, Jackie Patru, and offered to do a website for her. At the time, I was just getting my feet wet into web development, already having launched Doubters.net (no longer online), and decided it would be good practice for me to do another practice site for someone. I thought if I got good enough, I might be able to make a business out of it. Out of that effort, grew a huge behemoth by the name of Sweet Liberty, which took a lot more of my time than I had ever anticipated. Sweet Liberty kind of became Jackie’s website and I still felt like I needed some place that I could call my own. I launched the original DarrenWeeks.net and it remained online for many years. At some point, probably around 2002, I got to know another broadcast host by the name of Chris Gerner. He needed a webmaster and so I ended up taking on his site AmerikanExpose.com. Probably around 2003 or 2004, at Chris’ urging, I began filling in one night a week on his show, Amerikan Expose on First Amendment Radio. Eventually, Jackie Patru quit her show and I took over for her for a while. We had a disagreement about a third party posting headlines on the Sweet Liberty website, so I decided it would probably be best if I had my own operation so I could do whatever I wanted with it. After thinking and praying long and hard about a name, I finally settled upon Govern America, and to my utter amazement, the .com of the domain was still available — something that was very important to me. The First Amendment Radio show was renamed to Govern America and lasted until the network owner decided to move my show to an undesirable time slot. I ended up quitting there and for six months mainly spent time writing and working on web development. Then, Michael Powers, who worked for Republic Broadcasting Network at the time, somehow discovered my broadcast archives on the website and contacted me to ask why I quit. He said he had listened to several hours of the show and was impressed with the information, and wondered if would be interested in going on RBN. I started on that network on June 28, 2008 and stayed there until I got frustrated with technical and communications problems, and left some time in 2015. After leaving RBN, my co-host, Nancy Levant, and I had planned to just do a weekly podcast, but we had a chat room and people wanted to be able to listen as we recorded the show. So I decided to launch a stream for them. To my surprise, RBN picked up the show and kept airing it for six months after we left. We had apparently left at the height of the show’s popularity. People wanted to be able to call in so I got my own toll-free number. It took a while to figure out how to do the infrastructure, but we eventually found a way to smoothly stack and take calls on the air. I already had automation to run opens and bumps, so I just simply programmed some breaks into my existing automation. I found some separate automation for the streams so that I was able to run them 24/7, and was able to add a couple of lower bit rate streams for the bandwidth-challenged people. Little did I realize at the time that we were building a de facto radio network, piece by piece. Most people plan on building a network; we just built one out of necessity. Eventually, RBN gave up and moved on, after efforts to get us back didn’t prove fruitful. Also, the fact that our clock format didn’t match theirs was problematic for them. We still had some people running radio stations that wanted to carry the show, but it was more convenient for them to pick it up off of the satellite as opposed to Internet streams. After discussing the problem, one of our broadcaster friends, Steve O’Brien, made contact with Frank Steffan, the owner of American Voice Radio. We entered into talks with him, and reached a deal for satellite time on that network. Since that time, we have had a number of other Internet networks and radio stations contact us to simulcast the broadcast. It is really exciting to see things grow! We work very hard to provide good information for people. Nancy Levant had decided to retire, and after spending a year going solo, I decided I liked having a co-host better. I was grateful that Vicky Davis agreed to step in and fill the role. She had been a long-time guest and brings a lot of deep research to the show. This is how everything evolved into what it has become today. I will probably add more to this page at a later date when I think about what else needs to be here. They say politics isn’t something you should ever talk about. I have wondered who came up with this silly rule. Is it the people who have made such a mess of the world and don’t want the people to fix it? After all, how can you ever hope to solve any problem if you are unable to discuss it? My political views are really all over the map. I have been misunderstood and attacked by both the left and the right. I don’t believe in hero worship when it comes to politicians. If they start behaving badly, they should be called out for it regardless of party affiliation. I come from a conservative Christian background and am pro-life. I’m all for women’s rights, but when there is an unborn woman or man in the womb, that is life that is worth protecting. However, I am reluctantly in favor of the death penalty for violent felons. I say “reluctantly”, as I don’t trust the so-called “justice” system to really give people fair trials. I believe you can’t have a country unless you enforce its borders. If people sneak into the country, they are not “undocumented immigrants”; they are illegal aliens and should be prosecuted for breaking our laws. However, I am not anti-immigrant. If a foreigner wants to apply for citizenship and go through the proper legal process, then I am all for welcoming them into our country. I believe there are only two genders. If you are unclear as to which one you are, look down your pants for clarity. If you are not a male or a female, then you either have (A) a birth defect, or (B) a mental illness. The fact that this could even be considered controversial today, shows how far we’ve slipped as a society. I believe in the right to keep and bear arms, and it isn’t the job of government, media, or anyone else to decide what weapons we “need”. On the flip side, I would be considered a liberal on some issues. For example, though I have never touched the stuff nor do I ever plan to, I do favor legalization of marijuana because I think people should have the right to put into their bodies anything they want. Just like raw milk, it shouldn’t be the government’s job to stop people from consuming it, or producing it, if they want. Furthermore, the war on drugs has been a disaster and done very little but waste a lot of money, while putting a lot of otherwise innocent, and small-time “offenders” behind bars. The prisons are stuffed full of these people. I am also strongly against all current wars, because they are never fought for the reasons governments claim. Wars have predominantly become business decisions made by the wealthy — not anything that is consistent with the well-being of the countries, or the People that are doing the fighting. I believe in free markets, but not to the degree that we allow corporations to become so powerful that they dictate policy by controlling the politicians. I believe government regulations should be light upon small businesses, but the bigger the corporation becomes, the greater its tendency toward psychopathy, and the greater the need for regulatory actions against it. I am just a man, horrified about what my country is becoming, wanting desperately to be positive about the future, hopeful that I can maintain freedom for my children and, someday, my grandchildren. I’ve always been very introverted, and subsequently, misunderstood by people. This used to bother me a lot, until I decided to quit worrying as much about what people think. I also realized that most people, doing the gossiping about you, are generally screwed up, themselves. So why worry about it? The only reason they tend to focus on someone else, is to deflect from their own problems. I don’t expect anyone to agree with everything I say. However, it would be nice if everyone could go back to having civil conversations, rather than yelling at one another. On some points, we might have to agree to disagree and leave it at that. But, if people would go back to having real conversations, they might find that we are not as divided as we think we are. One wish I have for humanity is a return to respect. It is the most basic of virtues we learned growing up. How is it that society has somehow abandoned it? Perhaps, some have never learned it. This site is kind of a dumping ground for my thoughts on all subjects. I do some writing on my Govern America site, and I am an official contributor to NewsWithViews.com, but those are political entities. I plan to use this site for thoughts that are not necessarily related to political items. I like to write, though find that I often lack the time to pursue that passion. You will even occasionally find poems that I write, scattered across this site, when the mood strikes.